As it is the height of summer here in the northern hemisphere and the temperatures in my tanks can get as high as 85F (30C) I figured a post on cooling an aquarium would be relevant and useful. 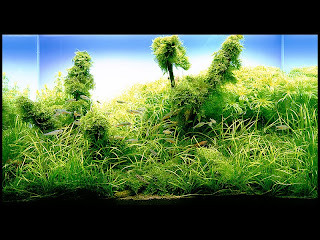 If you don't have air conditioning in the room where your aquarium is located or in your home at all, these tips can help to reduce the stress on your aquarium. Just like the sun on a hot summer day, the lighting in your aquarium is probably responsible for most of the heat raising the temperature in your aquarium. 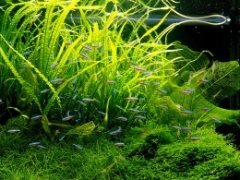 With planted aquariums, the lighting often gets very hot and if the temperature of the room where the aquarium is is high as well, this can rapidly warm the water. Therefore, one of the ways to cool your aquarium is to cool your lights. Cooling the aquarium lights also helps to extend the lives of the bulbs, so if your lighting doesn't come with any sort of ventilation fans, consider adding some. They can be purchased at almost any aquarium supply shop or online. Another way to cool your lights is to raise them up off any sort of canopy you may have. This will improve air flow around them and in turn reduce their temperatures. Also, removing an aquarium lid or canopy can also reduce the temperature in the aquarium through evaporation. As the water evaporates, it cools the remaining water and with the top of the aquarium open, evaporation occurs much more rapidly. The downside to this is you will have to top up your aquarium much more frequently to make up for the increase in evaporation. For a simple and cheap way to cool your lights and your aquarium at the same time, try placing a regular household fan next to your aquarium at water level so it is blowing across the top of the water. Or you can get specially designed aquarium cooling fans like the ones above. By moving air across the surface, you are increasing the rate of evaporation and therefore cooling the remaining water. The moving air will also cool the lights. Again, the downside to this approach is watching the water level and topping it off to make up for all that water being lost. If you have money to spend, the best option for cooling an aquarium is a chiller. These are not cheap and are usually at least $500 but it is basically an air conditioner for your aquarium. Some use electricity and a semiconductor to cool the water and others move the water past coolant. I would only really recommend these if you have money to burn or if you live in an area where the temperature of your tank is consistently pushing 85-90F (30-32C) and you are trying to keep heat sensitive specimens such as shrimp. A final, and marginally effective method is to do partial water changes with cool water. A word of warning here: do not use very cold water and do not change a lot of the water at once. Large temperature swings will be very stressful on your fish and could end up in illness or death. Instead, change small amounts with slightly cooler water often. Another idea I've seen discussed is to use a small plastic container floated on the surface full of ice. As long as you have good circulation in your aquarium and as long as it isn't too much ice, this should work alright as well. However neither method will bring the temperature down very low without a lot of effort. It's been incredibly warm here, and I made the *huge* mistake of turning off my aquarium lights, so that they were only on a few hours a day. Within a week, I could see the effect it had on my plants, and now I feel little stupid. I've since switched to using a fan and topping off the water. I've had aquariums for while, but moved last year, so it's a new problem for me in the summer. Your Images are impressive and intresting. Add More Photos .We eager to watch your postings.